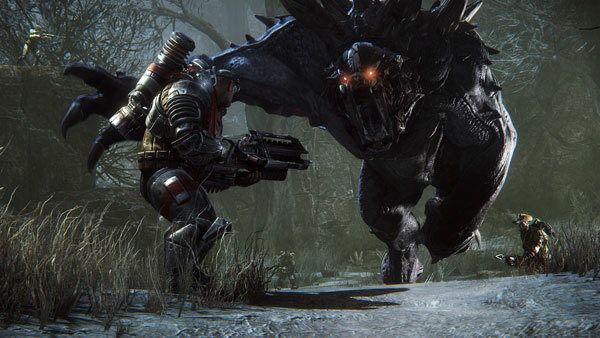 Evolve is the “evolutionary” successor to Left 4 Dead from Turtle Rock Studios which takes players to a harsh colony planet of Shear on the outskirts of the solar system. 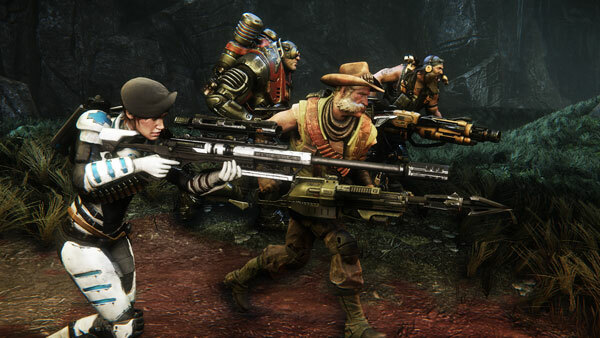 Available on the PC, PS4 and XBox One, Evolve is cooperative multiplayer shooter with a huge twist. 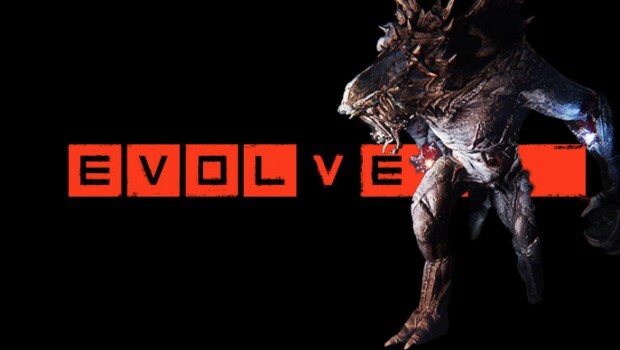 Unlike Left 4 Dead, Evolve throws a unique gaming mechanic into the title by pitting 4 cooperative players (Assault, Support, Medic and Trapper) against a powerful player controlled monster (the Goliath) that has the ability to evolve into three powerful stages. 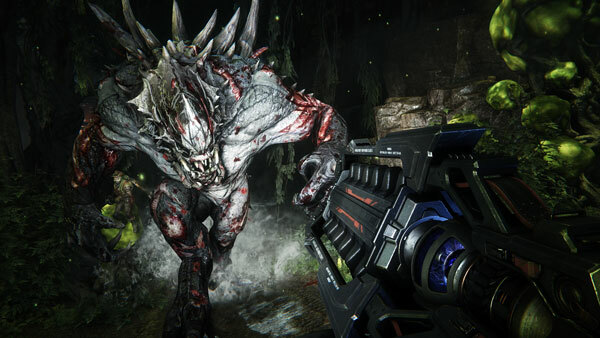 As the four players work together in first person mode to take down the monster, the fifth player who controls the beast actually plays in third person which really opens up a new dynamic to the gameplay as it is completely different to that of the humans. 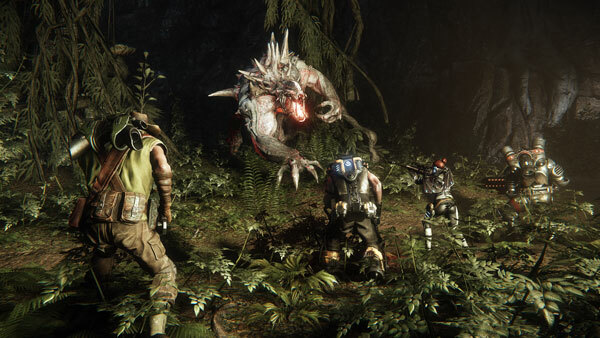 Although Turtle Rock Studios did not breach the story of Evolve to the media, the premise behind the game is that humanity have colonized the stars, however the colonists cannot fully colonize the planet unless the “monster hunters” take down the creature who is not a native to the planet either. The end result is a vicious battle between humans and monster with only one victor. It’s also bloody fun! 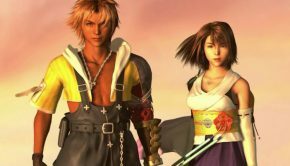 So how does all this mixed gameplay and different strategies work? Although we only played for a few hours and the game is still in an early beta stage, it not only played exceptionally well of the Alienware PC (5 players on a LAN) but also looked like eye candy with its detailed alien landscape, realistic foliage and smooth animations. The highlight of the game is of course the monster itself who eventually becomes a gigantic behemoth capable of destroying not just the hunters but also the human colony. As mentioned, the monster has the ability to evolve three times which increases its size, power and armour. This is done by attacking the local inhabitants that look like something out of Jurassic Park or Avatar and then consuming their bodies. As a result, it allows the player to upgrade the monster such as armour or different attacks which is dependent on your diet. There are also bonuses for certain creatures that you eat. 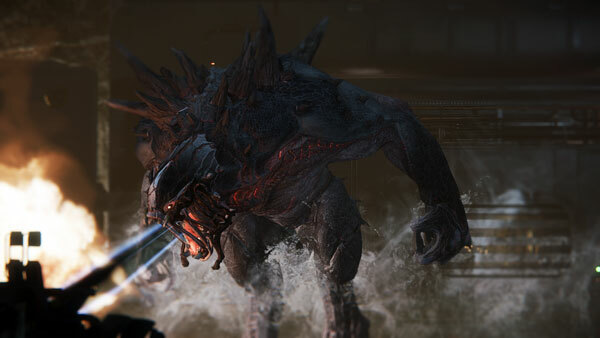 The monster also has the ability to use its senses such as smelling the scent of enemies which then highlights them with your vision and is a vital element of gameplay. In the game that I played, the monster had the ability of breathing fire, charging at enemies, swiping and pounding them into their next life. You also get to choose which abilities that your monster gets before you start and as you progress, you have the power to which abilities you want to upgrade. It’s a cool little upgrade system. 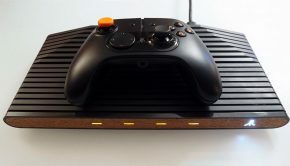 In terms of controls, they were well mapped on the controller and for PC owners you get the option of playing with a mouse and keyboard as well. It should also be mentioned that the third person perspective definitely assists in controlling the monster, especially with its melee like attacks. Would this have worked in first person? Personally I believe the game would lose something if Turtle Rock Studios chose this path so no. Also the kid gamer inside me sees a parallel of the monster Lizzie from Rampage due to the beasts smashing and jumping… not that there’s anything wrong with that with that! It’s just a cool parallel. Then you have the humans who must work in conjunction to defeat the beast. With four classes, each class plays slightly differently. The first class is assault which is the tank or soldier class. 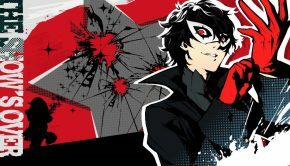 This class can deal huge damage and also take more damage then the others. Without a component player controlling this class it will make taking down the Goliath quite difficult. 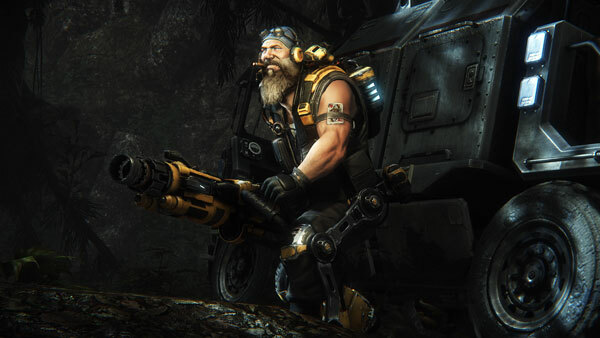 The assault class has access to a futuristic machine gun and a lightning gun which deals a huge amount of damage but is restricted in its use by a recharge. This class also has access to a personal shield and land mines which deal large amounts of damage. Although all players can revive their colleagues on the battlefield (provided the monster had not consumed their corpse), the medic can heal directly via a healing beam which is a key part of the gaming strategy. Medics also have a sniper rifle which assists in breaking down the armour of the monster. If you cannot be retrieved and do die, you then need to wait a few minutes until the drop ship delivers you back to the planet. The Trapper has the ability of assisting the players hunt the creature with a device that amplifies your target’s whereabouts. 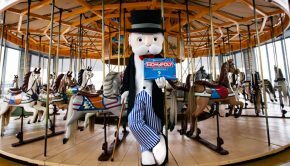 However where the Trapper shines is with its harpoon gun that basically holds the beast in place while the team attempts to take it down. 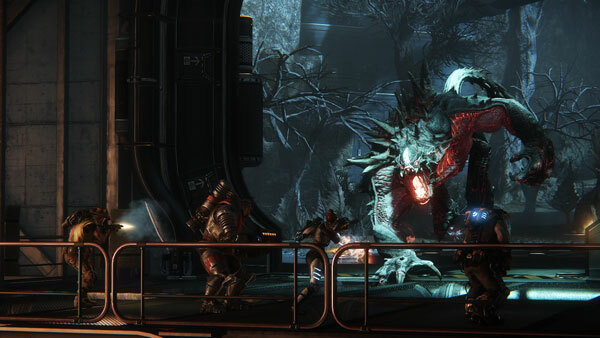 Another key element of the Trapper is a mobile arena shield that encompasses the creature in a huge dome so that the players can hunt it down in an enclosed area. Lastly you have the support class who gives other players shields and the ability of calling down an air strikes plus a weapon called the laser cutter which deals good damage and the most important element the cloaking device. To keep things balanced, these special abilities can only be used for a set duration of time. 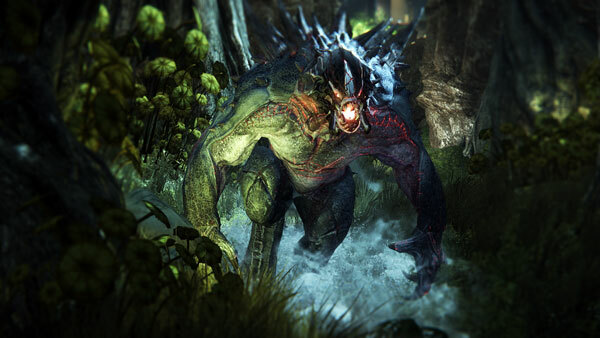 Turtle Rock Studios are definitely onto a winner with Evolve and if this is only a fraction of the unfinished product that I played, I for one cannot wait for the finished version in Spring 2014. The developers have definitely taken online gaming to a new level with the inclusion of first person gaming vs third person gaming. The game caters for both the team player and the soloist who likes to take on the world but best of all, both modes play exceptionally well and more importantly is quite balanced if you have flawless teamwork. 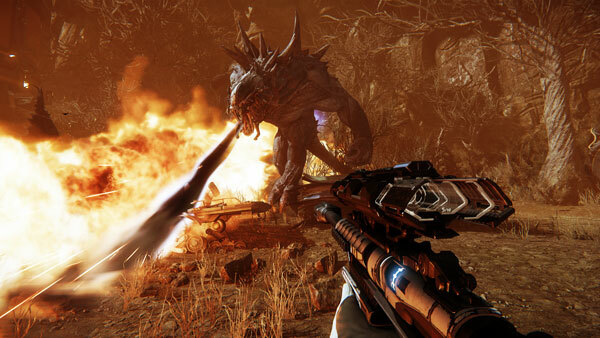 Evolve will definitely change the face of gaming when it’s released later this year.